This Bulls team took a hard right cross with Derrick Rose’s season ending injury and then a stunning uppercut when Luol Deng was traded. The mantra was to go out and play the games. They didn’t admit it, but they wondered. Was it too much of a beating? Was a knockout looming? Not as much reason to as it turns out. 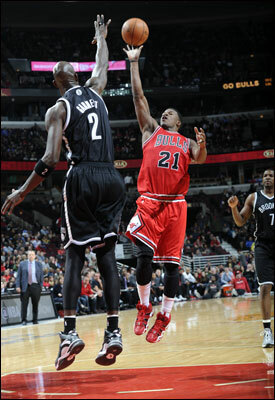 Butler scored 14 points along with three more steals and two blocks and a fierce defensive game against Joe Johnson. Nothing’s been accomplished yet. They all know that. But in closing the first part of the season Thursday on national TNT with an impressive 92-76 victory over the Brooklyn Nets, the Bulls are an unlikely 27-25 with their third consecutive win and just a game out of third place in the Eastern Conference. The Bulls clinched the season series over the more highly regarded Nets with five players in double figures led by Taj Gibson off the bench with 16 points. Carlos Boozer back from three games out with a calf injury had 15 points and 10 rebounds in just over 27 minutes and Noah added 14 points, 13 rebounds and seven assists, becoming the fifth center in the last 25 years, according to Elias statistics, to lead his team in assists at the All-Star break. Mike Dunleavy and Jimmy Butler also added 14 points, Butler with three more steals and two blocks and a fierce defensive game against Joe Johnson, who grew so frustrated with Butler’s stickum defense that he and Butler squared off after a third quarter Johnson elbow. Both got technicals, but Johnson also got the point. These guys aren’t going away. With the Nets climbing back within 75-72 with 6:29 left after the Bulls led by 16, D.J. Augustin hit yet another clutch fourth quarter three. Then led by Butler, Gibson and Noah, the Bulls smothered the Nets high scoring, even more highly paid backcourt of Johnson and Deron Williams. With physical individual play and double team help wherever the Nets players turned, the Bulls held the Nets scoreless the next five possessions. Butler then took Johnson inside and scored on a Gibson pass, Noah hit one of the inexplicable left handed runners and Gibson added a baseline 17 footer on a sharp pass from Noah that gave the Bulls an 84-72 lead with just over three minutes left and sent the Nets into a timeout and effectively ended the game. Johnson and Williams were a combined two of 10 in the fourth quarter while Kevin Garnett was scoreless, barely able to get off one shot and not acting so brave anymore. “I’m a live in the moment kind of guy,” Noah laughed when asked about looking forward. “I’m really happy we won tonight. I’m going to enjoy my night tonight; I’m going to enjoy my night tomorrow night; I’m going to enjoy my night the night after that. And then I’ll worry about the second half of the season. Who knows what’s ahead for these Bulls. But it’s been one of the more remarkable stories of the NBA this season. They’re not a headline up there with LeBron or Durant, the Pacers or the Trailblazers’ surge. But here’s a Bulls team essentially dismissed not only with the loss of Rose but the trade of Deng. They had to put reserves in the starting lineup, like Mike Dunleavy, and guys who were released, like Augustin, in the regular rotation and starting. The roster is barely up to NBA minimums with players traded, like Marquis Teague, and some little used veterans. But coach Tom Thibodeau’s preparation and demands combined with the high level character and competitive commitment of the players has produced an unusual winning alchemy that was difficult to predict and at times curious to even understand. It has been a group effort with no player averaging even 15 points, the fewest for a leading scorer of any team in the league. But the Bulls continue to do it the hard way, once again with a huge rebounding edge, 45-27 as Brooklyn plays a small lineup with Brook Lopez out for the season. The Bulls also move the ball unselfishly, no shot good enough if there’s a better one. Noah and Kirk Hinrich each had seven assists as the Bulls had 26 on 35 baskets. That’s compared to the isolation oriented Nets with just 12 assists, Williams and Johnson constantly dribbling and a lot of standing around. Paul Pierce led with 15 points and he had zero assists. It’s a stark contrast to watch the more famous Nets’ players. They showed flashes of defensive interest, but not the commitment to carry it through as the Bulls pulled away down the stretch for the double digit finale. Hey, who’s arguing with them now? The Bulls got off to a strong start again, a 29-19 first quarter lead with Boozer and Gibson combining for 13 points against the smaller Nets. The Bulls are now 21-4 overall this season when leading after the first period and 15-0 at home. Boozer was back after missing three games with Gibson averaging more than 20 points and 10 rebounds and raising questions about whether he should become the starter. But Gibson went back to the bench and Thibodeau said that would remain best for the team. 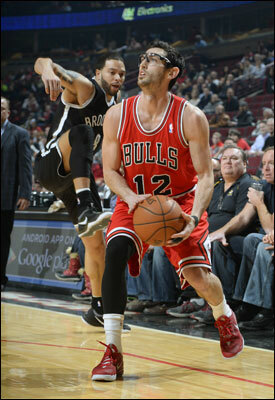 Hinrich recorded seven assists as the Bulls had 26 on 35 baskets. That’s compared to the isolation oriented Nets with just 12 assists. “You have to look at our team in totality,” said Thibodeau. “For us to achieve the things we want to achieve, we need Carlos and we need Carlos to play well. Carlos is a huge part of our team. With our depth up front, we really have three starters and they all have to sacrifice for the team. That is one of our strengths. Carlos is another guy you can throw the ball into, very good in the pick and roll, and he is a really good rebounder. That goes a long way. Like I said, the rebounding was the difference tonight. Once he got his second wind, I thought he was very, very good. He was better than I thought he would be. You look at what he did, 15 and 10 in 27 minutes is excellent production. It’s not only what he’s doing. When he’s on the floor, it’s going to force matchups and that’s going to create other opportunities for us. And neither left much out on the floor for the overmatched Nets with Boozer, Gibson and Noah combining for more overall and offensive rebounds than the entire Nets team. The Bulls held onto a 49-41 halftime lead after almost blowing the game open earlier when Butler just missed Gibson on a lob with the Bulls leading by 11. But you could see the frustration growing on the prettier Nets players as Bulls defenders were making everything difficult with physical play, hands in their faces when they shot and help whenever they tried to turn a corner over a screen. Finally, Johnson blinked and hit Butler with an elbow midway through the third quarter after the Bulls went back ahead 62-53 after an early second half Nets run behind a pair of Pierce threes. Butler warned Johnson something likely about not messing with Texas and Johnson gave him a shove, which sent players running between them. Noah then held off Butler and gave him a long and animated lecture, which likely was about letting them lose their cool. Not you. “I never remember in those situations when something happens (what I said).” claimed Noah. The Bulls raised their ferocity after that, building their lead back to 12 behind a strong quarter from Boozer with nine points. The Nets then made their last run early in the fourth quarter before Augustin, who hadn’t hit a field goal through three quarters, didn’t hesitate on that three which gave the Bulls a 78-72 lead with 6:03 left. From there, the Bulls delivered the basketball version of the goal line stand with the Nets going nowhere in shooting 26 percent in the fourth quarter. And then Johnson and Noah headed to New Orleans to be All-Star teammates. There’s a lot of hugging around the NBA, though it’s doubtful Noah will be a part of much of it. For the Nets and a lot of other opponents these days, it’s just awkward trying to figure out how they’re not beating a Bulls team like this.